Uniquely illustrated Baby Shower invitations with rustic and modern designs to celebrate the impending arrival of your new baby with family and friends. Popular designs include under the sea baby shower invitations, daisy baby shower invitations, and cute animal illustrations like frog baby shower invitations. These custom invitations are personalized with your celebration details! Nearly any invitation design can be worded for any occasion, unless specifically stated otherwise. Simply provide the wording you require to fit your event or celebration. Wording can be different than the template image pictured. With your order of any of these custom Baby Shower invitations, you will receive a complimentary proofing process with the Designer. This means you will be emailed a proof image of your invitation for your review and approval before your order is printed. 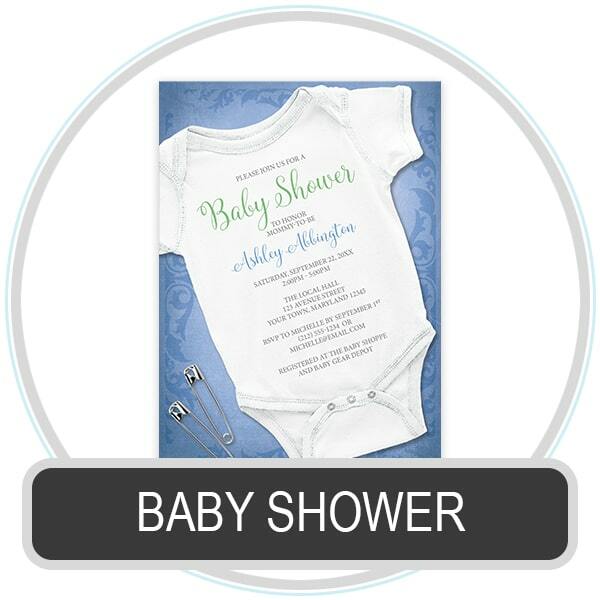 This allows us to work together to get your baby shower invitations just as you want them.